The First B’ney Yosef National Congress was held May 25th – 28th, 2015, at the Eshel HaShomron hotel in Ariel, Israel. There were 135 people in attendance, representing some 12 countries. The prevailing attitude throughout the days of the Congress and the two days beforehand (Shabbat and Shavuot) was one of humility, love, and unity. All attendees seemed to be keenly aware that this was an historic event and that it was the work of the Father. From all around the world, we had each heard from Him to come and were responding to His call. The common theme was that the Father is in the process of gathering the long-lost and dispersed members of the House of Israel (the Ephraimites), which requires repentance for the sake of our own reconstitution as well as for reunification with our Jewish brothers in the land promised to our forefathers. Much time was also spent in group discussions on issues of identity, community, communications, education and more, with a variety of proposals being put forth for practical steps. Repentance: The entire body of participants prayed together for the forgiveness of the sins that we ourselves as well as our forefathers have committed against Elohim, one another, and our Jewish brethren. However, the main purpose was to get our own house in order, and that included forgiveness and reconciliation. It was unanimously accepted that this needed to be done before we could make any plans or efforts toward reconciliation with the House of Judah. We must first approach one another with an attitude of humility, seeking to come alongside and serve in whatever way we can. We must not have any hint of arrogance or pride. In our current locations, we should strive to seek out one another in the Hebraic roots camp as well as our Jewish brothers. We should strive toward establishing honest and open relationships. It came to our awareness that many in Israel and in some Jewish communities already know about the lost tribes, as the Father has been opening eyes and starting to prepare hearts to be eventually reunited with their long-lost brothers. The re-gathering of His people may yet take some time, lasting beyond the lifetimes of some of us. We need to make a conscious and active effort to educate and encourage those in our communities who are younger to carry on this work of restoration and reunification. We need to continue to gently but actively encourage our brothers in the traditional Christian church to examine the Hebrew roots of the faith, and to heed the call of the Ruach HaKodesh as He moves in their hearts to bring them to a fuller understanding of who they are in the Father’s plan of redemption. There were many special times of Praise and Worship during the Congress. We were blessed to have several very talented musicians in attendance. Below are links to a selection of music videos that present some of the musical selections that we enjoyed. Live music performed by Ann Schultz and Ed Boring also contributed to the worshipful atmosphere at the Congress. Many of those who attended the Congress submitted written comments concerning their experience. Feel free to read some of these comments below. 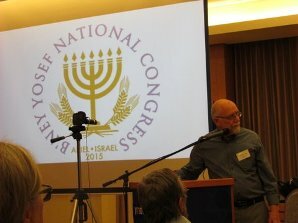 Here is our brief reflection on the Bney Yosef National Congress. It was amazing! Truly an atmosphere of Psalm/Teh 133 was breathed by all those attending the Congress. It truly is a beautiful thing to see brothers responding in love and unity with one another. Mike Clayton said, "Keep your tent pegs loose." This was affirmed by dear friends of ours in South Carolina. YHWH heard the cry of His people and saw that we are ready for the next step. We just need to continue to walk in the precedence that was set at this Congress. It is not about us. It is about Israel. It is about the Restoration of a people and a nation. Am Israel Chai!! Our ears never heard a single theological argument. Everyone had a vision for this one task before us all. Come together as a people; focus on our unity as people and cry out to YHWH in repentance to restore a nation again. In our repentance, we knew what cast us out of the good Land. The Ruach HaKodesh made clear what will bring us back. Love one another, serve one another, and our King will answer us. Heaven will touch earth as the covenant of His people's inheritance is restored. Reflections on the first B’ney Yosef National Congress from which may I never recover. What an honour I felt heading to Ariel. How great an honour it is to look back at having been at this congress! I approached with joy and good expectations, but soberly. I had some reservations and fears. Having been a square peg in a round hole my whole life I have wondered for thirty years as a believer, if the “Behold how good and pleasant it is when brethren dwell together in heavenly unity” would ever land here on earth. My worst nightmare had been that when Mashiach arrived nothing much would change. I have tasted fragments of His Beauty in connections, but belonging has been evasive and elusive for me. I braced myself for a measure of increase of restoration of that beauty. I was armed with something I had written about the need for room for variety and diversity in this restoration. I prayed about when I should share it. A wall of love refused thought of any agendas, even “good” ones. I was enabled to trust Abba Yah with my place in all this; my longing to belong usefully. Eyes on Him, eyes opened, His Kingdom of power immersed me like I have never known. And this was pre-congress. I didn’t share what I had written, because it was all spoken out and felt there. Questions remained but they were free from any anxious attachment. Six years ago I went to something very different; a mirage in the wilderness, a loveless, driven, ambitious project that made my soul shrink deep inside. I knew that this Congress was going to be different but how can you foresee such a contrasting experience? How Abba out smarts us, surprises us, overwhelms us, over powers us, loves us! My life is changed. I am empowered to trust and wait on Him like never before. May this boost take me deeper into my calling; that individual calling that only Abba knows for each one of us. Thanks to all who served us at the congress. My testimony about the Congress. When I first heard about the Congress I was very excited. I wanted to come but also wanted to make sure it was from the Father. I prayed and prayed for a word from Him and he woke me in the middle of the night saying " for such a time as this". I knew that was what I was supposed to be there. I later received your email confirming that word. I am so thankful now that I was able to come. The highlight of the congress for me was meeting so many that are on the same page from all over the world. There was so much love and unity of this gathering. I believe like you said it is about the Fathers Heart and our faithfulness and repentance. The Father will gather us all back! I was really moved by the speakers that opened up so much of their heart. I enjoyed the Armenian speaker that shared what they all have gone through and where they are now. Also, the lawyer that was just so full of knowledge took time to come speak to us. Thank you Ephraim and Rimona for all that you did in organizing this Congress. I really felt your love of the Father and your desire to be obedient to Him. I am so grateful I am a part of this congress for such a time as this. Much can be said about the story of the twelve spies. We can dwell on the faith of Joshua and Caleb or we can drone on about the disbelief of the other ten. What we should keep in mind is not to repeat the mistakes of our predecessors. Of course, it is fitting that the two tribes that got it right back then were Judah and Ephraim. It is likewise fitting that this First Ephraimite National Congress would have both of those tribes represented. In a spirit of true unity, all those who attended shared together in a truly fruitful gathering. To say that this was anything less than a miraculous event would be selling it short. Over 130 participants from around the world convened in a hotel that has survived two bombings and financially crippling Intifada. Testimonies from all the representatives of the provision that had made their trips possible poured in. Most people felt called to come, but lacked the resources to do so. One by one, the stories seemed all too familiar. Friends, congregations, or sometimes strangers found a way to lift up each person and provide whatever was required. So many found their way by grace. The few that could make it very early noticed that there was something special about the group that was coming together. As the hotel filled, there was a common theme. It was not by design or by our own meager efforts, but there was a palpable unity. There were so many conversations that were interrupted by the phrase "we were just talking about that." I have never witnessed such a crowd of people on the same wavelength. Of course the group was diverse. Most regions did not have more than two participants. Each one of the participants seemed not to know what to expect, yet eager to see what was on the horizon. We went as a group to Elon Moreh, Shiloh and toured the Biblical Garden that was constructed on the grounds of the hotel. Also, guest speakers covered the gamut of working community models, integration of foreigners into the Israeli paradigm, and Legal considerations. Members of the Congress spoke at length about outlined points that were in need of consideration. Through days of deliberation on selected topics, a compilation of key thoughts was put together and is being produced for posterity and reflection. All together, the group seemed to be feeling the pulse of the land and were directing the guidance that we had each been given toward a common purpose. I know that I was blessed by the experience. We have all had moments where we felt inspiration and have likewise met frustration in earnest. Amongst the congress attendees, I did not hear any negative reports and I saw only encouragement and a tempered anticipation for the direction that lay in store for Ephraim and Judah together. With the zeal that Caleb had before us, we were ready to start right there in that hotel. The overwhelming consensus was a need of finding a way to work hand in hand with our brothers. Both Ephraim and Judah on the same team for the same King. On a general note, we recognized that the whole of Israel could only be unified once Ephraim was able to get along amongst our own tribes. Of course, this will be done in His hand, but that is not an excuse for people who claim to be brothers to squabble, bicker, and spar until there are no more synonyms to describe the disputes. I was in the land for 6 full days and did not have one negative experience while I was there. I did not have one cross word with a brother, sister, or proposed enemy for that matter. It felt like I was in an enclosure of the Father's design and given a purpose with a very real endgame in mind. The King will be coming home. I want to have my house and my heart in order when He gets here. The congress was a very hopeful example that If you feel that same way, you are not alone. I am so honored to have been a part of this historic congress--praise Yahweh! I was so incredibly blessed by the offer to join in a free private tour the week before the Congress. How incredibly gracious of the Wyatts! Our time together helped lay a foundation of trust, joy, and unity. Our time together on Shabbat and Shavuot provided this opportunity as well. Special thanks to the Franks for making all of these arrangements! And I was especially blessed to have roomed with dear, sweet Elisheva--who is incredibly gifted in playing the viola. I am blown away that representatives from our brother Judah are actually welcoming us to the Land and saying that it is our inheritance too. What an amazing thing! And how amazing to live most of your life getting to know Messiah as one who forgives your sins and cares intimately and personally for you--only to discover that he's not just going to take you to heaven you when you die, but that he's made you part of a plan on THIS EARTH--he's made you part of the people of Israel who will return to and inherit the Promised Land! It seems almost too good to be true. I praise him for the opportunity and faith to take part in this prophetic move, and I'm so grateful for those who have gone before and laid a foundation for the rest of us to walk upon. My prayer is that we walk forward now in even greater faith and step into the promises and make good on all the things that were discussed and suggested. I've had the chance to share my experiences with several of friends and coworkers, and they are now asking for more information about Hebrew Roots and Judah and Ephraim. The revolution is spreading. Am Israel Chai! It is impossible in a few short paragraphs to summarize what I witnessed in the weeks leading up to the B'ney Yosef Congress and then the Congress itself. There have been few times in my life when I have felt so at peace and so in the center of the will of my King. This, my very first, trip into the Land was preceded by many who had concerns for my safety (there are giants in the Land), while others trumpeted the fruitfulness and blessings. Knowing Caleb and Joshua were from Judah and Ephraim respectively, I read the story again before going to remind myself of the significance of the mission as we considered the Two sticks prophecy. Having returned, and having seen (toured) the land from Masada to Dan and Tel Aviv to the Golan, I have nothing but good to report. Besides the amazing fruitfulness of the Land that we witnessed, it was the deep love, joy and peace (fruits of the Spirit) we sensed from every single Congressional delegate. While the Congress was not to begin until Monday evening, May 25, 2015, our little group of six thought we'd arrive at the EShel Hashomron on Erev Shabbat to have a restful and worshipful weekend in preparation. By our Father's divine leading, roughly half of the congregants had the same idea and as we checked in, we walked into a buzzing room of joy, peace and love, meeting brothers and sisters from all over the world for the first time. Deep times of worship and repentance permeated the atmosphere. During the Congress, many items of business with tentative steps for beginnings were proposed and discussed, but it is the amazing Presence of the Spirit, the palpable peace, love and unity that I will always remember and cherish. I know not where this leads, or what our Father's timing may be, but I do know this, He was there and we tasted of something incredible. With that tangible stamp of approval, I wait with near breathless anticipation of what He does next and how He leads us into these prophecy-laden days. May our King be glorified through us. Attending the first B'ney Yosef National Congress was an appointment fulfilled for me. Since I was a "new kid on the block" and previously knew none of the attendees, it was endearing to meet some of my family. It was certainly a peaceful relief not to have to be continually "explaining" my awakened understanding of who I am in Ephraim. It was great to be on the same page with family who share my history, and with family who are now eager to go forward, completely by the leading of YHVH. I appreciated Ephraim and Rimona Frank's untiring attention to details and the presentation of information about actually being in and supporting The Land, either on visits or return. I, reluctantly, resumed my temporary place in the nation of my exile, realizing there are those, unknowingly, still seeking an awakening. I may be here until the "fullness of the Gentiles" that are in my sphere of influence, by YHVH, come in. I believe that time is short. All praise to the Father of Lights in Whom there is no turning and from Whom our steps are ordered. I think if we never lose sight of this, B'ney Yosef will always remain in a safe place with Abba. Another comment that I've been pondering is that as we minimize our doctrinal differences (even those we know have very pagan origins) we are better able to maximize Torah. I was also very touched as Shadi Kahlloul shared. It seemed to me that he was saying that here in the Middle East, during these hundreds of years, there was enough trust between Judah and them that when needed, they would come to one on other's defense. I think this is quite the thing for the rest of B'ney Yosef to ponder. With regards to what the lawyer shared, I found it very interesting that as long as an Israeli would give the tax guarantee it was not so very hard to establish a business here.......and also that land values continue to increase. I appreciated the underlying theme of repent and return (Teshuva) that I believe continued to manifest in a spirit of humility and unity among the members present. All who gave presentations had wonderful points to make in coming together as a nation returning as a prodigal from exile. I especially appreciated what John Conrad said about the covenant blessing, that it is a coming together and that scattering is a sign of judgment and quoted Yeshua saying: “He who does not gather with me scatters,” as well as other scriptures regarding this topic. And then, I appreciated that the setting of the conference was so that we would gather together in discussion groups to discuss how we can work in practical ways to gather and assemble together with each other and with our brother Judah. I appreciated hearing from Hanoch Young that there are those in Judah, like himself seeing, desiring and working towards the same goals. This also was very encouraging. It will be glorious on that day when again we will be restored as One Nation under Elohim, with our banner being Yeshua. Christian's bold exhortations and insights that he shared with us on repentance and gathering as well, I believe, were Holy Spirit driven and given maybe as a prophetic gift of a seer. I appreciated his courage and boldness. Getting to meet and come to know the mishpacha from other lands was delightful! When I arrived at the hotel in Ariel, I was immediately met with a spirit of love and cooperation, and not with intense debates that I was expecting. I was able to connect with over 130 delegates from thirteen countries around the world, and I believe that each and every man and woman who was present there was called– just as Queen Esther– for such a time as this. I very quickly realized that coming into this movement with a preconceived agenda was not within the Father’s will for any of us; instead, what He had planned was bigger than any one of us, but included all of us. I have been involved in the Torah-walk for nearly a decade now, and my mind, thoughts, and opinions have changed numerous times on various issues; but there has never been anything like the paradigm shift that I acquired at the Congress. Before I departed for Israel, I had developed the idea that I was a delegate from my home town, to represent Ephraimite believers in the Pacific Northwest– but as it turns out, I had it all backwards. I was called to go to the Congress to acquire a vision of the restoration of our nation, so that I could be a delegate from the Land of Israel to the Pacific Northwest, to share the vision of restoration and reconciliation with my Ephraimite brothers and sisters in my own (temporary) home town. An essential part of this vision comes down to simply living out the Fruit of the Spirit– love, joy, patience, peace, kindness, goodness, faithfulness, gentleness, and self-control in our walk with others. While these are qualities that we should be familiar with, the Messianic movement has been sorely lacking them in our relationships with not only other Ephraimites, but with our brother Judah as well. It is by displaying these qualities toward fellow Ephraimites that we will be set apart as disciples of the Living Messiah, and it is by displaying these qualities toward the House of Judah that we will show our Jewish brothers that we are serious about being who the Father has called us to be. Another part of this vision is unity. Now I am not referring here to unity in doctrine, but unity in purpose; not unity in race, but unity in heritage; not unity in belief, but unity in action. It is not sufficient for Ephraim to be united under a banner of how we tie our tzitziyot, or how we pronounce the name of God, or which calendar we use; rather, we must come united under a banner of repentance– first for the sins of our fathers, who forsook the covenant which God made with us at the base of Mount Moab; and second for our sins toward our brother Judah: for the arrogance we have shown him, and for our many hateful accusations of him. I believe, with perfect faith, that the 130+ delegates have returned to their own homes in the diaspora, to all the countries which our fathers were scattered to, understanding that the vision of unity which was established during those three game-changing days is an essential element of our restoration as a people, as a global community, and eventually as a sovereign nation, drawn together from the four corners of the world. In closing, I would like to share something on a personal note. When I came into the Torah lifestyle, I lost most of my family. When I came to the B’ney Yosef Congress, I found them again. Being in the congressional room with 135 other Ephraimite delegates gave me a picture of the scope and the size of our family. When I was with those fellow believers, I ceased to be of European descent. I ceased to be an American. I ceased to be of my own gentile family. Instead, I was a Hebrew, an Israelite; specifically, I was an Ephraimite, and I was surrounded by my own people, my own family, and those of my own nation. My name is Tommy Wilson, I’m 56 and I live in South Carolina with my wife. While listening to you and your wife on Hebrew Nation Radio after the B’Ney Yosef Congress, I felt inspired to write you. I have been following the reports of the Congress ever since Pete Rambo talked about it at our fellowship a couple of weeks before he left for Israel. The things he shared with our small group of about 40 moved most of us to tears, including myself. I knew at that moment the Spirit of YHVH was moving and He definitely got our attention. There were expressions of excitement, joy, prayers, words of encouragement, etc. I knew this was the Father because my heart leaped! I was anticipating to hear how the Congress went and read, listened and watched everything that was posted. As I was listening to you and Rimona describe as best you could your experience and what it was like, my heart leaped again! Specifically when you shared about the “constant level of peace” in the midst of diversity, and you “all saw yourselves as humble servants” of the Almighty, and that “this is the spirit that needs to invade this movement”, and “from the heart of individuals to one another founded and connected to the heart of the Father built from underneath”, and “the ones who are mature that breath life, love and kingdom nature into a community”, and “the spirit moving in practical things”,.....my heart connected!! These are the characteristics that our Father clearly wants and I long to hear and experience more of what I perceive you described! With the passage of time, some impressions arising from attending the May, 2015 B'Ney Yosef Congress stand out more than others in my mind and I expect others may have found this as well. My recollections are not intended to diminish any of the other wonderful insights and revelations from the Father we all received, but are only to illustrate the diversity and uniqueness in the way we each hear individually, but that what all of us receive together forms the fullness of the revelation of the Father. One of the major highlights that I was impressed with is the unity from the diversity that the Father is wanting to bring forth in maturity in each of us, as we see the oneness that He desires for us in Him - not by our human fleshly thoughts that demand we all agree about everything, but by His mind established in us by the unity of His Spirit of Life in Ye'shua. This idea began to emerge to me soon after we arrived in Ariel the Thursday before the Congress itself 'officially' began. As we gathered for Shabbat and Shavuot, I felt there was already a cry coming from the Father's Heart for us, His children, to lay down our cherished ideas of doctrines and practices that have kept us divided from one another. Issues of preference such as calendars and dates and names must not keep us from reuniting our hearts with others who may appear to think differently, but who share a common love and longing for the Messiah. Along with that plea, which continued to unfold throughout our days together, emerged more facets of what those barriers to unity really were, through heartfelt pleas from our brother Hanoch Young for love and humility in our view of, and relationships with our elder brother Judah, who has kept the testimony of the Father's love alive in Torah through the ages. Areas of pride and arrogance were revealed in my heart as I began to realize that I was still carrying much baggage from past erroneous teachings from various Christian and even Messianic sources. I realized how often I viewed myself as more enlightened and knowledgable than those of my brothers who have kept the faith and love of our Father through ages of untold grief and hardship, but not necessarily in the ways I had been taught by man's doctrines to believe. I think this was a major breakthrough at the Congress that led to our making repentance/teshuva to the Father so that our common purpose in seeing the re-uniting of Judah and Ephraim will not be hindered by our attitudes and separation from the wonderful richness of the Spirit of Elohim deposited in our brother Judah, as well as in other non-Messianic believers in the eternal Elohim of our forefathers. This was a paradigm shift for me, as I began to glimpse the revelation of the Father's love and plan of redemption for all of us, His beloved creation, without restrictions of past and present religious belief systems shrouding my thinking about who He was calling in accomplishing His eternal purposes and how others worked out that calling. Another area that stood out to me was the need for correct Torah teachings to be developed and made widely available, not only to us 'more seasoned in years', but also to the young people of our communities, so that they have the opportunity, with us, to learn with fresh eyes and renewed spirits to study the Torah. While 'rightly dividing the word of truth' is often mentioned in religious circles, many of our existing teachings and doctrines may in fact be misleading and even faulty, adding further barriers to re-uniting with Judah. A few examples presented by Frank Houtz made it clear that our lack of a proper methodology in studying and understanding the whole revelation of Torah is seriously hindering us from laying aside old prejudices and misconceptions that have kept us bound in the ideas of man, rather than alive in the words of the Living Torah, Ye'shua. Along with this need for correct teachings, and a means to develop them, such as the College in Kentucky, there is a need for adequate funds from the larger community of B'ney Yosef to support this, as well as funds to enable others, especially the younger people, to be able to visit our inheritance, the land of Israel, and, as opportunities arise, to work alongside our brothers already there to build relationship with them as the Father leads. What a joy and privilege it always is to be in The Land of Israel, this precious Land promised to our forefathers ...to Avraham, Yitzchak, and Ya'akov, and this time to be part of the B'Ney Yosef Congress, and there meet with brothers and sisters from many countries from around the globe. It was an awesome privilege to worship together our Abba YHWH, Elohim Most High! and to share together and be encouraged in His Wonderful Redeeming Love. The theme I saw emerging at the congress was of Abba's Ahava/Covenant Love for us, and His Unity 'in diversity' among us as the House of Yosef... to prepare us, as the younger brother ( the prodigal as it were) .....to walk in humility toward our elder brother Judah, and to 'see' him as the brother who carries The Torah in his life. And just as it was The Father Who revealed The Son to me, it is The Father Who will reveal The Son to my brother Judah. Likewise, just as The Father revealed The Torah to my brother Judah, it is The Father Who is continuing to open my eyes of understanding to His Torah! It seems, therefore, a paradigm shift or different perspective is emerging in my thinking, especially as one brother at the congress gave a teaching regarding ' the great commission', which in my understanding boiled down to 'the sh'ma lifestyle'..... so that Abba's Love, His Blessing, His doing Tov, His praying.... comes through me to and for others, ....'whoever' that might be. This has been freeing for me.... a release from putting people or groups of people in 'my tiny' boxes! In speaking with and 'hearing' some of our 'elder' brothers in Israel, I was able to hear their heart of love for The Elohim of Avraham, Yitzchak & Yaakov. One brother told us that loving Elohim is to keep His Instructions. Deut 11. This reminded me of Ye'shua speaking in John 14:15 "if you love Me (The Living Torah) keep My mitzvot"; and also in John 14:23 "Ye'shua answered and said to him, if a man loves Me, he will guard My Words: and My Abba will love him, and We will come to him, and make Our Stay with him". After my sharing this 'paradigm shift' of my thinking regarding my brother Judah with a dear friend, she encouraged me to see that a paradigm shift/ restructuring of our thinking has to come and affect every facet of our personal lives.... the way we 'see' ourselves; our opinions about what is right and wrong; what is good and evil; our likes and dislikes; our appetites; our wills; our finances; etc, etc. Our Loving Abba is calling us into an ever-deepening relationship with Himself each day through His Empowerment, His Living Torah, our precious, Loving Kinsman Redeemer, Yahoshuah! So much has happened since Natanel, Suzzi and Kay went to the Bnei Yoseph congress, and as Hadassah told us, because they were there, so were we! I thought of the verse that says when Avraham gave the tithe to Melchizedek (Gen 14:18-24), we were there in his loins (Heb 7:10). So even more simply, it seems to me that all those delegates at the congress were representing all of us who by faith are crossing over into our inheritance, planting seeds of the return of Ephraim to the land of our fathers in a Yovel-Shmitah year and therefore are being required to identify and respond to this awesome move of Yahwey. For me the process started when I realized, round about the time of the Parasha (in Numbers 13) that centers on the sending of the spies to the land of Canaan, the parallelism to the representatives from the 12 nations who were in the land of our inheritance in the hotel in Shomron (Samaria), and who also went to Shiloh, which was where the tribes were united for the last time. Natanel brought back a good report, as did Hadassah and Yochanan. The overriding impression from them was the beautiful unity at the congress that was overwhelming and certainly caused a blessing to flow not only to those present, but spilled over onto us as they shared their good report. I loved what Yochanon said that, he had a glimpse of the beauty of Yeshua reflected in His people, as they all came together like a spectrum with different characters and giftings, but all with humility and grace, reflecting the glory of Yahwey. Inspired by Psalm 133, Isaiah 11:9, Yochanan was sensing that this is the unity that we have not yet experienced in the body of Messiah, but that we are on the threshold of seeing and being a part of this type of unity as we cross over into our Inheritance, both spiritually where we are, and as we make our way back to the land physically. The Congress was about finding out that the nation we are coming back into is so beautiful, loving and caring (Deut 7:7-9). The Father is bringing back the fullness of His image in us. Natanel shared that before the congress, whilst at the Dead Sea in his hotel, there was a group of people suffering with skin diseases (“leprosy”) who had come to bathe in the sea for healing. I was reminded of the 10 lepers (representing 10 tribes) healed by Yeshua on the border of the Gallil and Shomron. I wondered why we were represented by lepers. Leprosy makes us unclean, and is also associated with the sin of Lashon ha’rah, gossip. Well, Natanel reminded us that we and our mind 1 Peter 1:15-16: “As He who has called you is Holy, so be Holy in all manner of conversation.” A couple of individuals went to Shechem (Nablus), where the bones of Yoseph are buried. Ezekiel 37:3 says: "can these bones live?" We are in the days of seeing the bones of Bnei Yoseph living again, and in the days described in Ezekiel 20:41-42. The congress recognized that returning Ephraimites are identified by their unity as Mishpakah (family) unified in humility and love, keeping Torah, observing Shabbat and the other feasts of Yahwey (Matt 5:17). The tribes were scattered because of our rebellion, so repentance is key in our return to the ancient paths. We need to learn in humility from Judah. Natanel said that the congress was like an arrow being shot into the land, their hosts in the hotel being Jewish, was a reminder of Zechariah 8:23 and 9:13. Hanoch made the comment that the church has nothing to make Judah jealous ... Thus it is our identity as Ephraim that is the foundation of our relationship with Yeshua and the Torah (and with the Jewish brothers). As we learn humbly and come alongside Judah we need a renewal of the mind; shaking off our misplaced identity as Gentiles and realizing that we are a remnant who are returning with songs unto Zion, (re)grafted into the Olive tree of Israel, one new man in Messiah (Roms 11:17-26....Ephs2:19). "Therefore the redeemed of Adonai will return and come with singing unto Zion and everlasting joy shall be upon their heads!" (Isa 35:10). In the Amidah (which means ‘standing’) prayer that is prayed by religious Jews every day it says: "Sound upon the great Shofar our freedom! Raise the great banner to gather the exiles and assemble us together from the four corners of the earth. Blessed are you O Adonai, who gathers together the dispersed of your people Israel" (see Micah 2:12-13). In Ezekiel 11:15 Adonai says: “though I removed them (Israel) far off among the nations and scattered them among the countries, yet I have been to them a little sanctuary, for a little while in the countries to which they have come… Therefore says Adonai Elohim, I will gather you from the peoples and assemble you out of the countries where you have been scattered, and give you back to the land of Israel." In an earlier e mail Ephraim said that, "now in the redemption and reconciliation through Yeshua the Corner Stone, we have become His sanctuary, Yeshuah also being the High Priest whose anointing, according to Psalm 133, depends on the unity of the brethren. Reconciliation through forgiveness is the catalyst for unity". On the heart level, the theme of the Bnai Yoseph congress was Ezekiel 37:19: One stick of the house of Judah and the house of Joseph in the hand of Adonai. This unity prevailed throughout the congress, as they sought the Father's face and heart on the gathering of the lost sheep of the house of Israel and our reunification with Judah. Repentance is the key. It seems as though the Father has been speaking to us all through the Parasha readings, especially in the account of the spies in the land - those that gave the good report. Next was the promised inheritance in the land of the tribes (Numbers 36). And now the Parashas in Deuteronomy, at the end of Israel’s 40 years of wandering (Deut 1:3), when the 2nd generation is on the threshold of entering into their inheritance of the land. This all coincided with my listening to Jim Staley’s teaching on Gilgal - the first place that the 2nd generation camped at when they crossed the Jordan (Josh 5:19). Gilgal is one of five places where you can see a footprint on the land from an aerial view (see Josh 1:3&:7-9, and verse 11: "prepare to pass through the Jordan into the land God is giving you to possess"). They crossed on the 10th of Nissan, the day the Passover lambs were selected and chosen. The 2nd generation had been chosen in a similar way to the lambs. The Ark of the Covenant was carried on the shoulders of the priests who went before the people into the waters, which were cut off and held back in a heap (Josh 3:11-17), suggesting the cutting of a covenant. The people crossed over and 12 men from each tribe took a stone and placed it in the Jordan for a memorial that would never be seen when the waters flooded the Jordan once again. Jim Staley taught here that we are living stones, and as the living water of the Word covers us we will not be seen - only the Son will be seen in us. It seems to me that the Father is stirring our hearts to our calling to be His spotless bride, to repent and circumcise our hearts. Another major thing of which we need to repent, is from not loving Adonai Elohim with all our hearts soul and strength, when we have not obeyed him and kept his commandments (Matt 5:17), and from not loving our neighbors as our selves.... all of the things that the congress was seeking to honor.